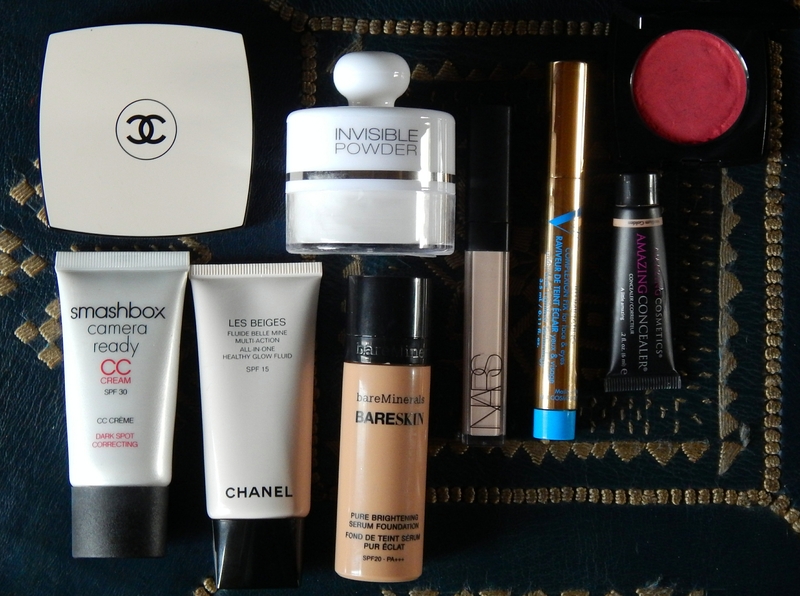 So it’s been a while since I updated you all on what’s in my make-up bag and quite a lot has changed. So here’s part one. My current favourite bases include Bare Minerals Bare Skin Pure Brightening Serum Foundation. I have never been a fan of their mineral powder foundation but I thought I would give this a go and I love it. Firstly a little goes a very long way – I use with my Real Techniques face brush and buff it on lightly. I only use 3 drops for a medium coverage. The finish is so natural and it also has an SPF 20 which is a real bonus. Another fave (has been for a while) is Smashbox CC cream which is a great all-in-one primer and perfector this time with an SPF 30. My final choice is Chanel Les Beiges Healthy Glow Fluid. I use shade 30. This just gives a sheer warmth to the skin. I also mix a tiny amount with other bases if I need to make a shade a little warmer. I am also a sucker for the smell of Chanel make-up! I always have a couple of bases on the go as I like to be able to wardrobe depending on how I feel and where I’m going. Even though I am getting a little older I still cannot give up using face powder. I usually use Laura Mercier loose powder but have just purchased this Kiko one today. It’s called Kiko Invisible Powder and cost just over £11.00. It’s super fine and colourless and so far looks very similar to the LM Brightening powder and the BB touch-up powders. This Kiko one comes with a puff embedded in the lid that you buff the powder on with so it should be relatively mess-free. Concealer-wise I currently use three different types. Amazing Cosmetics Amazing Concealer – I use this on any blemishes or areas I need extra cover on my face. A great level of pigment in a very fine product – again a little goes a long way. For my under-eye area I go between Nars Radiant Creamy Concealer – beautiful finish and great shades and my new must-have Veil Illuminating Complexion Fix. Veil Illuminating Complexion Fix has been created by a Canadian-based make-up artist friend of mine. It’s newly available in the UK at Blow Ltd. It’s an amazing pen-style illuminator without any pinky panda style flash. I also use this on areas of the face I want to add some light to. Chanel Les Beiges Healthy Glow Sheer Powder is my choice of bronzer. Again sheer with a great tone. No shimmer or muddy shades here! Finally for my face is that perfect pop of blush. I admit I am a slight blush obsessive not only on finding the right colours but more so the right texture. My bestest find ever in the world of blush is Chanel Cream Blush in the shade Chamade. It’s a cream powder finish which is super sheer so although it looks bright it gives you a sheer flush again with no shimmer. I buff this on with a Studio 10 face brush. Love it so much !! !